Hanoi in Vietnam attracts lot of visitors to its unique tourist destinations. However, when you look forward to other things to do in Hanoi after a hectic exploration of the tourist sites, you can straight head towards a vigorous shopping experience, Interestingly enough, Hanoi is known as one of the most attractive shopping destinations in Asia. And Shopping in Hanoi entails a lavish range of products from silk, tailoring, embroidery and handicrafts. We shall suggest you to visit Hang Da Market in Hanoi, which will take you back to the glory of history embedded in the old lanes of Hanoi. Hang Da Market in Hanoi is a popular hang-out among the locals and the tourists visiting the capital of Vietnam. 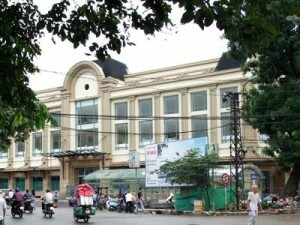 This shopping place retains the dying glory that the Old Quarter at Hanoi stands for. Located at the intersection of Yen Thai and Hang Da Street, Hang Da Market is a three-story indoor market, which will attract you with its white and multi-perforated façade almost kissing the skyline like a sky-scraping house. You will be put at wonders by the variety of products this market in Hoan Kiem District stocks, ranging from outdoor goods to green things to birds. – As you enter Hang Da Market in Hanoi, you will find vendors selling liquors on the left and just at the entry. – You will also find vendors selling food and flowers in these outer stalls. – You will be dumbstruck by the hullabaloo of traders and buyers inside the market. – If you want to buy fruits, vegetables, cooked meats and ceramics, you will get them in the ground floor of Hang Da Market in Hanoi. – Clothes, other fabric items and even watches are often sold in the second and third floors.